Currently operated by the fourth generation of farmers, our family has been proudly producing quality apples in concert (in harmony) with Mother Nature for over 100 years now! Come mid-August, our 10 000 apple trees are just waiting to be picked. Our orchard has just about a dozen varieties of apples, which can be harvested at different times of the season. 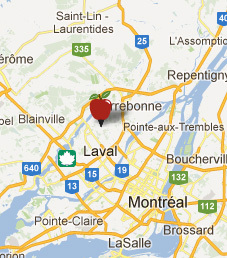 Located in Laval in the district of Auteuil, we are a kilometre east of Highway 19 on the avenue des Perron.